The College will present a musical salute to the members of the uniformed services during a Veterans Day concert. St. Scholastica's Concert Band and String Ensemble, along with special guests, will collaborate for the "Americana! 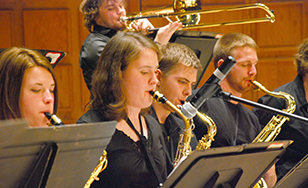 Veterans Day Concert" at 2 p.m. Saturday, Nov. 11 in the Mitchell Auditorium on campus. The concert will feature musical selections and styles illustrating America's musical heritage through the years, from patriotic selections and folk songs to fiddle tunes. Tickets are $5. For more information, visit spotlight.css.edu or call 218-723-7000. 2 p.m. April 29, 2018 - Pops, Concerto and Student Conductor Concert - the final band performance of the season.